Ashur Shamis, a Libyan opposition activist in London, and witnesses said the protest began Tuesday and lasted until the early hours Wednesday in the port city of Benghazi. Demonstrators chanted “no God but Allah, Moammar is the enemy of Allah” and “Down, down to corruption and to the corrupt.” Police and armed government backers quickly clamped down on the protesters, firing rubber bullets, Shami said. 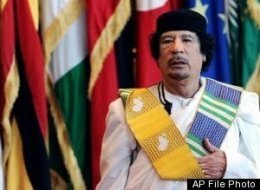 The outbreak of protests in Tunisia, Egypt, Yemen, Bahrain and Iran has roiled the Middle East and brought unprecedented pressure on leaders like Gadhafi who have held virtually unchecked power for decades. It also posed new challenges for the United States, which has strategic interests in each of the countries. President Barack Obama conceded Tuesday he is concerned about the region’s stability and prodded governments to get out ahead of the change. As in the uprisings that toppled longtime autocratic rulers in two countries flanking Libya – Egypt and Tunisia – Libyan activists are used social networking websites like Facebook and Twitter to rally people in their homeland. They called for a major protest on Thursday.